Happy beginning of spring! There’s something about longer days, filled with sunshine and above zero temps that make people happier, more optimistic and inspired to use color! I thought I’d share a fun and easy watercolor project for beginners that is sure to boost your creative spirit and mood! Fun & Easy Watercolor project for beginners. Watercolor paints: a dry palette, tubes, liquid, whatever you have on hand or can get a hold of! Paint brushes: One or two will do. I recommend a fine tip brush and a flat brush as well. About 30 minutes and a bright space to work at. My method for most of what I create, whether it’s painting or lettering, is to work intuitively. What that means ultimately is to not worry about things being planned, perfect or precise. It took me a while to get to the point where I let go of things being realistic, or centered or perfect. I love when something is done by hand and the lines aren’t straight, or the imagery is playful vs. strict, and constricting. 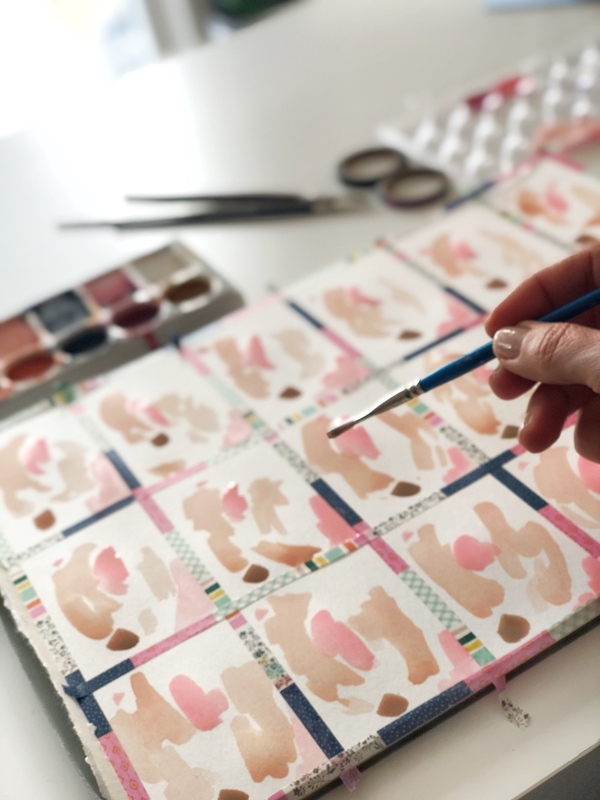 So for this fun and easy watercolor project, I decided to inspire you with how to use color and random brush marks to create fun, mini abstract paintings! I made these ones to use instead of business cards for my upcoming trip to Alt Summit and think they turned out perfectly! Use 11 X 14 sheet of watercolor paper and with washi tape, tape borders so you have nice, clean white border around your mini-paintings. decide on how little or large you’d like your finished abstract watercolor paintings to be. I choose really small ones which I think ended up being about 3 inches x 2 inches or so. I wanted them to be similar to the size of a business card, since my goal for this project was to create business cards. I did end up framing a couple because I loved how they turned out. I’ll show you a pic of my mini painting framed at the end of the instructions! Choose 5-7 colors that you’d like to use and start laying down some watercolor brush strokes. I wanted to create consistent looks, so I basically played with laying similar strokes of color on each square. TIP: when working with watercolor, make sure that your paint consistency is really wet. You’ll notice really interesting texture and transparency in your dried painting that you can only really achieve with watercolor. Add watercolor paint strokes that are long, circular, and simple. Don’t over think each stroke, just let the paint brush rest loosely and let your hand move intuitively. TIP: Playing music in the background will help loosen you up and set the mood. Don’t be afraid to add contrasting watercolors and even bold, more opaque pops of color, like the bright pink and even touches of black. When you are pleased with the amount of color you have in each square and you feel really happy with how it looks, put your brush down and stop! Sometimes we overwork pieces which happens when we think about them too much. Take a step away, look at your paintings and if they “feel” good, then they are finished! Wait until the paint is dry before you begin to peel away the washi tape. BIG TIP! Only when the paint has dried completely do you remove the washi tape border. You don’t want to risk smudging paint that is still wet! Trust me, I’m impatient, I’ve ruined perfectly good pieces because I didn’t wait for the paint to dry completely! I recommend a paper cutter to slice each painting, but scissors work fine too! Lastly, cut your pieces using a paper cutter (I got mine from Michaels), or use scissors to cut straight lines where you taped off the borders with the washi tape. That’s it!! Enjoy your mini, abstract watercolor paintings! Remember that I mentioned I framed a few of mine, I kept one for myself that sits on my desk and I love the hint of color when it catches my eye. I also added lettering to a larger abstract piece that I cut up and just wrote simple encouraging statements on. 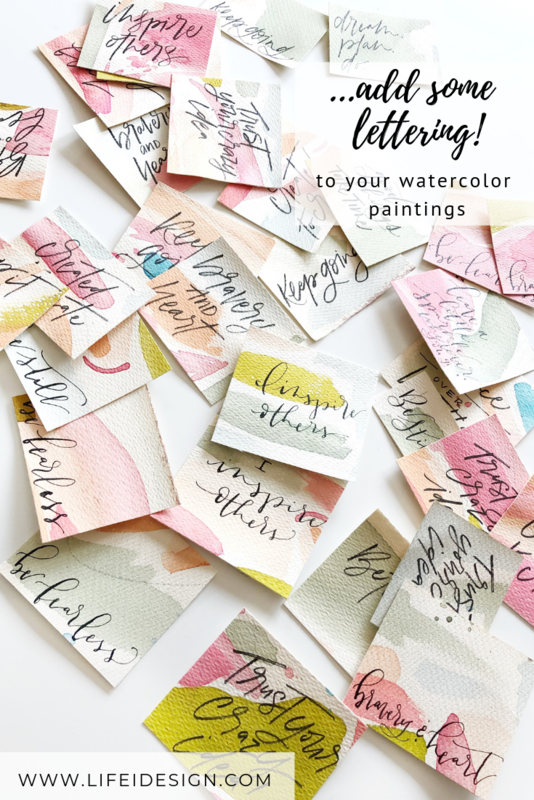 Add some lettering to your abstract watercolor minis too! I’ll be handing those out at Alt Summit too!! Use you lettering skills and with brush pen or dip pen, write out your message, a quote or a word! Intuitive, playful abstract watercolor paintings. Here is what I did while I waited for the other ones to dry!! I took some old sheets of watercolor paper, tore them up so they had rough edges, I grabbed a pencil and scribbled on each, then layed some bold, concentrated watercolor and even sprayed water on the paint strokes to add some cool texture and movement. Notice how different they look and feel compared to the other abstract minis?! I hope you enjoyed this fun & easy watercolor project for beginners that I put together. If you are looking to learn how to watercolor or learn lettering, check out my online classes here www.lifeidesignonline.com. If you are a member of Skillshare, you can watch all of my classes there too!